Hey, anyone wants more salad this month? It's another great and tasty salad, that I prepared one of these evenings when the heat was such that I couldn't even think about cooking. The best thing is that you can have it on its own, like we did, or as a side dish with some BBQ maybe. Once more, the flavours put together were simply delicious. This salad was supposed to be a zucchini carpaccio salad, which means prepared with raw zucchini, but I decided to grill mine for two reasons. One, I didn't have any small, baby zucchini, but one huge round zucchini that certainly wouldn't taste crispy as it should. And second, I was sure my husband would prefer the zucchini cooked or grilled rather than raw. I also substituted Kalamata olives for green olives, because I didn't have any. Slice zucchini thinly, brush with oil and grill shortly in a grilling pan. Cut tomatoes into 4-5 mm thick slices and arrange on one large or on 4 smaller plates. Season with salt and pepper. Sprinkle with olive oil. Mix feta cheese with chopped olives and place on top of zucchini. Lavate, asciugate e tagliate i pomodori a fettine sotili. Distribuite i pomodori su un piatto da portata grande oppure su 4 piatti singoli. 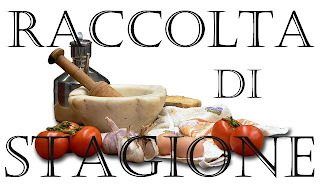 Lavate, asciugate e affettate le zucchine. Spennellate con un po' di olio e grigliatele per un paio di minuti per lato. Se avete le zucchine molto piccole e sode potete anche preparare questa insalata con il carpaccio di zucchine invece di grigliarle. Distribuite le zucchine sopra i pomodori. Salate e pepate. Sbricciolate un po' il formaggio con le mani o con la forchetta, aggiungete le olive trittate grossolanamente, e qualche foglia di menta spezzettata. Distribuite il formaggio sopra i pomodori e le zucchine. Condite con un filo d'olio. Mando anche questa ricetta a Betty, per la sua RACCOLTA DI STAGIONE. Narežite tikvice na ploškice debljine 2-3 milimetra, malo ih nauljite s obje strane i ispecite u gril tavi. Kad su gotove, malo ih posolite. Moja je tikvica bila ogromna, pa mi je bila dovoljna jedna. Narežite rajčice na ploškice i složite ih ili na jedan veliki tanjur ili na četiri manja u kojima ćete izravno poslužiti salatu. Posolite ih. Malo smrvite fetu vilicom, umiješajte masline (ja sam imala samo zelene, ali bolje bi išle crne Kalamata), i nekoliko narezanih listića mente. Stavite sir s maslinama preko tikvica. Začinite dobrim maslinovim uljem i s paprom po želji. buonissima questa insalata...con questo caldo è super! Salad are good in any month! Yum! Perfect salad when it's hot outside. Can't beat that in the heat. And it's hot here! You make the prettiest salads!! I bet the grilled zucchini was better than if it were raw...that extra flavor....yum!! This looks great! I am craving salads left and right!